The divas on stage at Symphony Hall for the Celebrity Series. Photos by Robert Torres. An intimate evening of French songs. Fleming and Graham interacted gloriously. The vocal recital has been said to be on its last legs for years now, but like other musical formats that have been written off as moribund - the string quartet concert, for instance - it has shown remarkable resiliency. 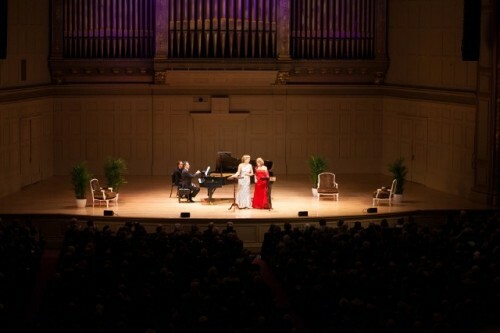 This week, thanks – much thanks – to the Celebrity Series, Bostonians will be able to test the health of the vocal recital with two concerts featuring real stars of the operatic stage, the caliber of singer heard here only in recital or as soloist with the symphony since our local opera company is, alas, unable to afford their services. This coming Friday, Finnish soprano Karita Mattila will present a solo recital of French and Finnish songs at Jordan Hall. 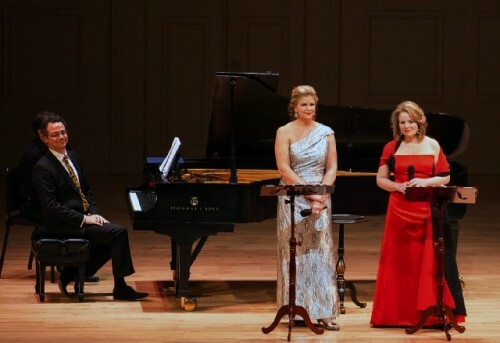 Sunday afternoon, soprano Renée Fleming and mezzo-soprano Susan Graham, Americans both, enchanted their Symphony Hall audience, seducing its collective heart with the warmth of their voices and personae. For the two hours they sang, there was no question about the vocal recital’s vital signs. And there was no question that these were divas who had chosen to entertain us. Both are stars of major international opera houses and have made many recordings, each winning Grammies, three for Fleming, one for Graham. Often the problem with divas singing songs, accompanied only by piano, is that they are unable to bring their voices down from the volume and projection required for the roles they sing in large theaters to the intimacy and subtlety necessary to properly communicate songs. Indeed, when I first heard Fleming in concert many years ago in San Francisco’s Herbst Theatre, which seats about as many people as Jordan Hall, her inability to adjust her large voice to a smaller stage kept the evening from being a total success. Fortunately, that was not an issue Sunday afternoon. Symphony Hall was the final venue of a mini-tour (six stops), and both singers performed as if the concert stage was their natural home. Their program, of French songs from the fin-de-siècle Belle Epoque era, was basically light, the sort of music one heard in the salons of the time; they chose to take the conceit of the salon and make it the structure of the evening, giving the easy pleasures of their singing a quasi-academic twist. As hostesses, Fleming and Graham were gracious and easy-going. Best girl friends forever since they first met 25 years ago at the Met Auditions, they are free and easy together. They punctuated their solos and duets with gossipy talk that painted an image of an upper class French salon where their songs might have been premiered among friends. We learned that Gabriel Fauré was a lady killer, his best students said to have been his illegitimate children, and that Reynaldo Hahn, who was “romantically involved” with Marcel Proust, sang his songs at the piano with a cigarette dangling from his mouth. With each tale, they pulled us in closer to their charmed circle, so that by the end of the afternoon, everyone standing and cheering, we paradoxically felt as if we had been guests at their salon. Before they appeared on stage, a recording of Mary Garden, the American singer who conquered the French stage a hundred plus years ago, the first Mélisande, was played, and selections from her ancient interview, salty at times and always frank, were played at intervals through the afternoon. Garden imparted two important ideas: singers must sing for everyone, le monde, and they must sing as if they were speaking directly to the listener. Both Fleming and Graham have taken the first point to heart. They are among the new generation of opera singers that has made opera popular again, packing opera houses and filling up movie theaters every Saturday afternoon with fans eager to hear the legendary Met. The latter point, however, was more pertinent for the evening. French art songs are particularly one on one – delivered from the singer to the individual listener – and both Fleming and Graham made you feel as if you were the sole recipient of their attentions. One reason for their success at basic communication was their precise enunciation. Graham’s French enunciation particularly was clear and idiomatic. If you understood French, you would be able to hear and understand every word she sang, a rare achievement of any singer in any language. Both Fleming and Graham are endowed with big warm voices, creamy or buttery or honeyed - whatever comparison you prefer. They sing together like a hand in a glove, their voices intertwining so that you can’t tell where one ends and the other begins. Opera composers love to write duets for two female voices, one high, the other even higher, and they go to any excuse to create such scenes. In the recent past there were legendary pairs of female singers who created electricity whenever they sang together: Joan Sutherland and Marilyn Horne, Montserrat Caballé and Shirley Verrett, Beverly Sills and Verrett (girl got around). Fleming and Graham, who have sung countless times together in the opera house, and now the concert stage as well, are the latest addition to that illustrious list. It’s evident that Fleming has passed her peak, which a few years ago was like a national monument – no one complained when she was promoted as “The Beautiful Voice” - but that doesn’t mean she’s ready to retire. Her voice is still honeyed, just a darker tone. Her high notes might not be as voluptuous, and they don’t pack the thrill they did not long ago, but she still hits them and they are still sweet. Although her career is a long as Fleming’s, Graham is now at her peak. Her recent Didon in Berlioz’s “Les Troyens” at the Met was the triumph of the season. And I’m sure many of Fleming’s fans were surprised that she not only held her own, but often surpassed Fleming in the production of tonal beauty. While it’s easy to dismiss French song as so much piffle, I admit I am guilty. Some of the songs on the concert were irredeemably slight, except that Fleming and Graham redeemed them - for the afternoon at least. I might never volunteer to listen to Hahn, even if he were Proust’s boy-toy, but Graham, who is his leading advocate today, made me listen. With her velvety voice, even and full throughout her range, she made me care for a moment about the first nightingale of spring to alight on the lilac bush beneath the poet’s window, or the young lovers in short silk jackets and long-trained dresses at a garden party, or the pair of unfaithful lovers who are falling out of love. 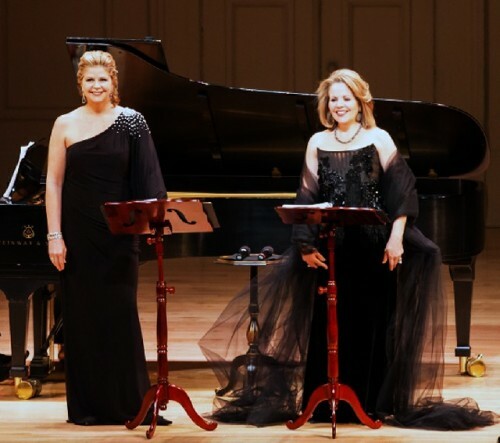 There were other slight songs by Saint-Saëns and Fauré – a connoisseur’s favorite I have never learned to love – that the duo made momentarily vivid. A scene from an operetta by André Messager, about two women, Blanche-Marie and Marie –Blanche who think they’re sisters but are not, was merely cute, but allowed the two singers to play up their professional sisterhood. Jacques Offenbach’s familiar “Barcarolle,” from “The Tales of Hoffmann,” was ravishing, a swoon fest. More substantial works were provided by Léo Delibes, Claude Debussy and Hector Berlioz, and when Delibes is included among the heavy weights, you know it was an afternoon of light pleasures. Still, his “Les Filles de Cadix,” a Spanish-tinged song about young love, sung by Fleming, was among the highlights of the afternoon. The vocalise at the end of each of the two strophes, gave Fleming the opportunity to show how fluent, how seductive her soprano still is. And it deserves its popularity. Like Offenbach’s “Barcarolle,” it is an unabashed wallow in ravishing female voices. Both look back to Italian bel canto, a style by the time they were composed that was quite old-fashioned. But, boy, if you love to hear two female voices, cut free from making any sense and allowed to just make beautiful sound, there is nothing more ravishing from the late 19the century. The Debussy songs, “Mandoline” and “Beau soir,” allowed Fleming to shine in a repertory that is her newest enthusiasm. (Her recording of French songs, “Poème,” is up for a Grammy.) In “Beau soir,” an elegiac song about the passage of time, she sang with full voice to devastating effect the word “beau” in the line “Cependant qu’on est jeune et que le soir est beau” (While there is youth and the evening is fair) which goes on to conclude, “Car nous nous en allons comme s’en va cette onde:/Elle à la mer – nous au tombeau!” (For we pass away, as the wave passes:/ The wave to the sea – we to the grave!) She delivered the last line, “Elle à la mer – nous au tombeau!” with such clarity that I bet even non-French speakers knew what she was singing. The recital’s undisputed highlight was Berlioz’s cantata, “La mort d’Ophélie,” written for solo voice, here done in its duet form. As Graham filled us in, Berlioz was madly in love with a British actress who played Ophelia. They had a tempestuous marriage and divorced, and she died young. This work, deeply passionate but restrained, was his commemoration of her. Berlioz gave the piano accompaniment a real role here, and the afternoon’s pianist, Bradley Moore, evocatively created the rhythm of the flowing water in which the poor, deluded girl who foolishly loved Hamlet, drowned. The cantata ends in a sad vocalize, which both singers made the most of. Of course, the highlight of any recital comes with the encores. Many were delighted by Graham’s adoption of Hahn’s dangling cigarette as she sang the Edith Piaf song, “La Vie en Rose.” However, the two singers undercut the point of the afternoon with the choice of the duet between the sisters Fiordiligi and Dorabella from Mozart’s “Così fan tutte.” Nothing sung until then, not even the Debussy and Berlioz, was simultaneously so musically complex and vocally ravishing. No more need be said about the French chanson, élas.